You know you want to live full or part-time in the Florida sun, but how do you go about actually purchasing a property there? When you set out to buy in Florida, be sure to take our in-depth guide to the Florida property buying process with you! Step one: What do you wish to buy in Florida? Before you can begin your property search, establish how you will be using it. This information will help your agent or realtor to direct your search accordingly. Will you simply be using the property as a vacation home? Will you just use the property when in town on business? Is it mainly an investment, or do you plan to make the move to Florida permanent? Simply buying a property in Florida (and the rest of the US) won’t grant you any rights to stay in the country long term, so if you plan to make a permanent move, you will have to apply for the necessary visa. Find out more here about how to get a visa for the USA. 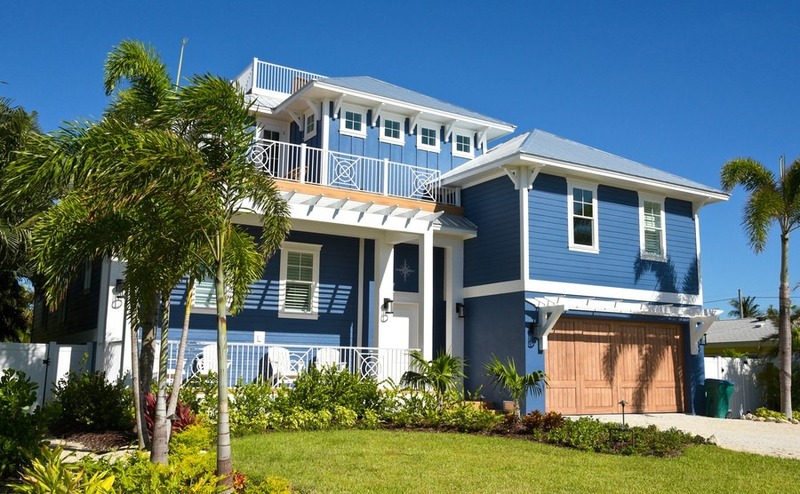 How do you go about buying a fabulous Florida home? The seller of the property pays the agent’s commission out of the proceeds of the sale. It is usually 6%, but they may try to negotiate it lower, especially on high value homes. Each state can have slightly different rules, but on the whole the process – and costs – are pretty standard across the country. Not all agents are realtors, but all realtors are agents. When you come to buy in Florida, look out for the Florida Association of Realtors. Overseas buyers may be confused by the various names and titles in the American property business, in particular the role of the “realtor”, or REALTOR® as they like to be called. An agent is simply someone licensed by the state to represent buyers and sellers in the property buying process. The agent will normally work for a broker, who has taken a few more exams and set up an agency/brokerage. A realtor is an agent or broker who has passed enough exams to become a member of the National Association of Realtors, hence the trademark. So not all agents are realtors, but all realtors are agents. When you come to buy in Florida, look out for the Florida Association of Realtors. Another complication is the fact that in the US you have sellers’ agents/brokers and buyers’ agents/brokers. This gets around the problem in the UK, where estate agents are paid by the seller and so are known to exaggerate or even, shock, horror, lie! A buyer’s broker only represents your interests, even though they are paid by the seller. The advantage of this is that to buy in Florida you don’t need to trek around lots of agents. Your own agent will source properties for you wherever they may be. In Florida, rather than a lawyer, many choose to employ a title insurance firm to review all the documents. While employing a lawyer is not a legal requirement, do employ someone to guide you through the legalities. Better safe than sorry! Whether you choose a lawyer or a title insurance firm, they will be able to review your sales contract for you, check the title on the property and all other documents relating to the purchase. They will also be able to offer invaluable advice on tax matters that concern your property. If you’re planning on buying a new build, make sure that your lawyer is independent from your estate agent. You need to know that they have your best interests at heart. Employ the services of a currency exchange specialist. If you are ready to buy in the USA, you’ll have a few financial matters to sort out. For advice on getting the best currency deal download the Property Buyer’s Guide to Currency. If you’re planning on buying your property with a mortgage, you’ll need to have an offer in place before you start your search. Should you wish to source your loan in the US, there are an array of home loan options. To secure a loan, you need to establish a good credit score within the US. There are many ways to do this, but you can start by opening a US bank account and credit card account. The type of loan you can secure in the US will depend upon the bank you choose; some will set a loan limit of $1-2 million. For others you may need to have a set amount deposited in their bank, $100,000 for example, to be approved. It’s also possible to source a mortgage for an overseas property from within the UK. Given that giving mortgages to the wrong people (sub-prime) almost ruined the global economy, you can understand if the rules are more stringent these days. Find out more about money matters and get personalised financial advice by getting in touch with an Independent Financial Advisor. If you plan on buying with cash, be aware that US law dictates all cash transactions over $10,000 must be reported to the Federal Government. They will want details of all parties involved in the property purchase, including you, the realtors, lawyers and any title companies involved. You may be asked to provide proof that you earned the money legally. Once you’ve found a realtor you’re happy with, send across details of your favoured location, budget, your nice-to-haves and deal breakers. Your realtor needs as much information as possible to help you find the perfect home. Next, pay a visit to Florida on a viewing trip to see a range of properties. With today’s technology (Google Streetview, VR, AR, etc) you can just about do it from the UK, if you choose. But this is the fun part, before you take on any responsibilities or have to make any decisons. Enjoy it! Don’t miss your free copy of our expert Viewing Trip Guide to find out how to make it a roaring success! You’ve found a property you wish to purchase. Well done! Next your lawyer/ title insurance firm will read through the Seller’s Disclosure document, which outlines any known problems with the property. If you’re satisfied with the document, make an offer. You can make it verbally or in writing. The seller is under no obligation to accept your offer, even if you offer the asking price. Once you’ve made an offer, you’re likely to hear back within a day or two to learn whether it’s been accepted, or you need to negotiate further. When the seller has accepted your offer, it’s time for the agents of the buyer and the seller to draw up the sales contracts. These contracts will include the title checks and property inspections. At this point, you must put up ‘earnest money’. This is a small portion of the overall deposit to demonstrate that you’re serious about the purchase. Pull out after this point and this earnest deposit will be at risk. One quirk of Florida property contracts is the “as is” contract. Contracts can include terms to cover any defects in the property. The seller may agree to fix any repairs or they may agree that the buyer will. The standard contract maintains that if problems are found with the home at inspection time, the seller must fix them. There is usually an allowance for these repairs, which the buyer is responsible for, typically amounting to 1.5% of the purchase price. The second type of contract is called an “as is” contract. It grew in popularity when foreclosed properties were sold off cheap. Effectively, you’re getting it cheap so don’t complain if it’s not perfect! Under the as is contract the buyer has 15 days to back out of the deal if they find a defect they do not wish to fix. Come and speak to us in person at Your Overseas Home. You’ll also have the chance to ask your queries to specialists in currency, finance, removals, law and more. Get your free tickets while they last. The amount you will lay down as an earnest deposit, and as a full deposit (after the due diligence stage is complete). This tends to be 10% of the purchase price. A proposed closing date. The majority of Florida property sales close within 30-45 days of going to contract. Repair limits, depending on the type of contract. An inventory of all items in the house included in the purchase. Finally, you (or your realtor/ representative with power of attorney) will attend a closing meeting with a settlement company who are employed to help you complete the transaction. You will run through all documentation, checking it and signing it as you go. The full balance is paid and both parties sign all documents. The transfer of ownership will also be registered with the local authority. Source a registered member of the Florida Association of Realtors. What if I can’t make it to the USA for the sale? While preferable, it’s not always possible to be in Florida to buy in Florida. In that case you can grant your US representative power of attorney to act on your behalf. You might also like to employ an American notary in the UK to oversee all of the paperwork. Closing costs – These include your mortgage set-up fees, legal costs, transfer fees and registration of the property. Together these typically amount to 4.5% of the sale price. If you aren’t taking out a mortgage, this cost will drop to 2.5%. Getting a good deal on your US home is often a question of good planning and research. Read our guide: How to Negotiate Abroad to give yourself a head start. Title services – Set aside $300 to cover the payment to the title service companies involved in the sale. Tax – Fortunately, Purchase Taxes are non-existent in Florida! You will have to set aside 1% of the value of the property for an annual tax every year. Property Insurance – You must take out a policy to cover the property and its contents. If you have a mortgage, the cost of this can be added to your monthly repayments. The cost of your policy will vary, but we recommend at least $300,000 liability cover on your main policy. If you plan on letting out your property, you may want to increase this to $1 million. If you’re considering buying in Florida, our free Resource Centre can provide you with invaluable advice and introductions. Fill in our enquiry form below to tell us what kind of properties you’re looking at, and we’ll be in touch with recommended local firms and experts.